Deep belly, straight mouth slanting slightly outword, belly gradually contracted downward, ring foot. A blue-and-white line is painted on the innerside of the mouth and the outer side is decorated with kids playing pattern: the sky floated with rosy clouds, a kid holding a line to fly a kite and another watching it with joyous posture; the rest three kids holding flowers playing, and the open ground decorated with patterns such as sunflower plant, Japanese banana trees, rockwork, flowers and grass, and so on. Apart from blue-and-white, red, green and reddish brown are also applied. The two columns within the ring foot are inscribed in regular script with blue-and-white characters which read "Daming Chenghua Nianzhi" (literally, made in the Chenghua Period of the Great Ming Dynasty). The cup is light and elegant in design with white and fine body. 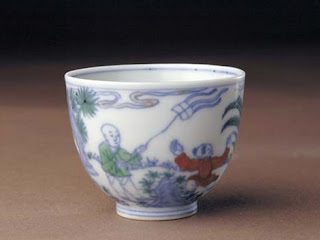 The kids-playing pattern was a rare subject in the Chenghua Period, hence quite precious. Straight mouth, plump shoulders, ring foot. Double blue-and-white cords on the outer side of the mouth are filled with yellow paint. A circle of blue-and-white lotus petals is covered on the shoulder. The body of the jar is decorated with six interlocking lotus flowers in blue-and-white with green the stem and leaves. The shank is ornamented with a ring of upstretching lotus petal pattern, and close to foot there are two string lines in yellow glaze and blue-and-white respectively. The bottom is inscribed with the character "tian" (sky) in regular script in blue-and-white. 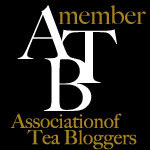 The cover has a flat top, in the middle of which is a lotus flower ball in blue and white applied with red glaze. The outer ring is edged with double lines in blue-and-white, between which yellow glaze is filled. The cover is fringed with a circle of blue-and-white curly branches, and there is a ring of double-line in blue-and-white close to the mouth. 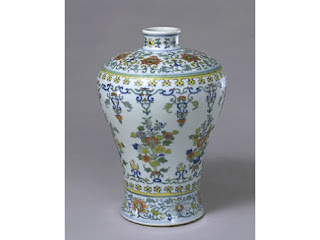 The jar, elegant and beautiful in design and bright and gentle in color, is the representative of the porcelain in Chenghua Period of the Ming Dynasty. Open mouth, rim slanting slightly outward, gradually contracted downward, shallow ring foot. On the bottom within the two square frames there are six characters in regular script reading "Daming Chenghua Nianzhi" (literally, made in Chenghua Period of the Great Ming Dynasty) in two lines. 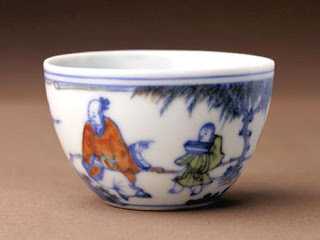 Two sets of doucai patterns are decorated on the outerside of the cup: one is "Wang Xizhi fond of goose", and the other "Yu Boya visiting friend with his qin", hence the name "gaoshi cup" (in Chinese, gaoshi means noble scholar; Wang Xizhi was a great calligraphist and Yu Boya a great musician). In the picture Wang Xizhi stands beside a pond wearing a red robe, overlooking the swimming goose. Behind him a young attendant in green is holding a volume of bamboo slips, surrounded by willows, wild flowers and drifting rosy clouds. On the other side Yu Boya is marching steadily forward, dressed in green with two hair buns on the head. A boy attendant in red follows him with qin in his arms. There are lush pine trees and cypress trees around, doted with clusters of wild chrysanthemums. The two groups of painting are mainly decorated with underglaze blue and white and overglaze red and aqua green, fresh and bright in color. 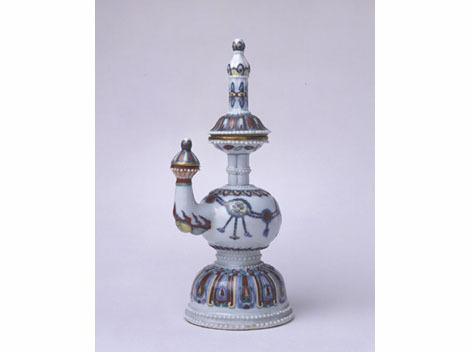 The vessel imitates the design of Tibetan silver benba (a transliteration of Tibetan language, meaning vase) pot, shaped like a pagoda. Both the mouth and the spout have a lid, presenting a novel and unique look. Straight mouth, curvy spout, round and bulgy belly, ring foot stretching outward. The vessel is divided into different units by white bulgy dots. Doucai is applied to lotus petal, ruyi cloud and fire and cloud patterns, and the theme pattern is the animal face and ornamental tassel patterns on the belly. Benba pot is a sacrificial artical used in the temples in Tibetan region. 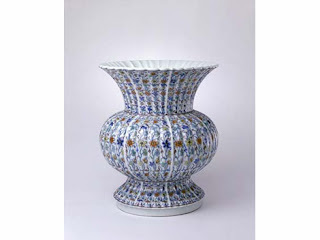 This vessel is a perfect combination of traditional Tibetan article design with the time-honored Han Chinese porcelain firing technic, and is the historical witness of the exchanges among various ethnic groups in the Qing Dynasty. Small mouth, short and straight neck, plump shoulder, flat and round belly, with cover. The patterns of dragon playing with the bead and phoenix playing with the bead in iron red glaze are decorated respectively in both sides of the belly. Doucai is only applied to the supplementary patterns on the less important parts such as neck, shoulder, shank and cover. On the bottom six characters in regular script written in two lines within the double blue-and-white rings, which read, "Daqing Kangxi Nianzhi" (literally, made in Kangxi Period of the Great Qing Dynasty). 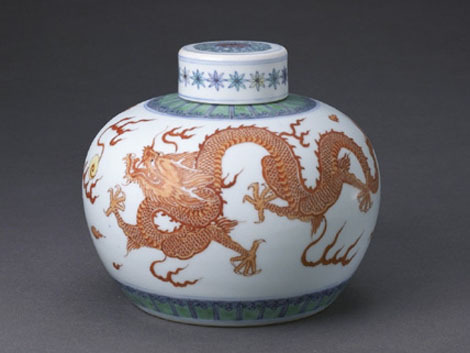 The vessel highlights the dragon and phoenix patterns, which are elaborately made and fringed by doucai, presenting a special artistic appeal. It is a specific embodiment of the application of the integrated decorating technics in the doucai porcelain of the Kangxi Period. Outward slanting mouth, round belly, high ring foot stretching outward. The vessel is in the chrysanthemum petal shape. The design is regular and elegant. The surface is decorated with vertically interlocking lotus patterns in doucai, which is novel in structure and light and elegant in color. On the bottom six characters in regular script written within the double blue-and-white rings, which read "Daming Chenghua Nianzhi" (literally, made in Chenghua Period of the Great Ming Dynasty). 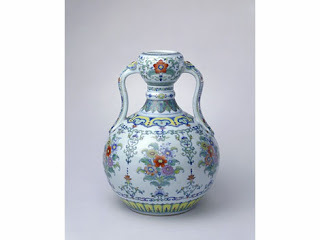 Actually, the vessel is just a duplication made in the Yongzheng Period when underglaze blue and white was combined with overglaze famille rose, which made doucai even fresher and more elegant. Straight mouth, plump shoulder, slim bottom, ring foot. The theme patterns on the body are divided into upper and lower lines, each having four medallions which are arranged in alternative. The upper part of the medallion is a butterfly, and the lower part consists of two chrysanthemums as well as their leaves and branches. Plucked lotus branches are decorated between medallions. 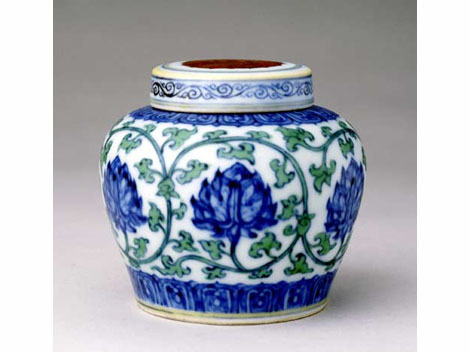 The shoulder and foot each has a ring of blue-and-white sea wave pattern, on which eight flowers of different colors are decorated. There is a medallion right in the middle of the cover. On the bottom of the jar six characters in regular script written in two lines within the double blue-and-white rings, which read, "Daqing Yongzheng Nianzhi" (literally, made in Yongzheng Period during the Great Qing Dynasty). Straight and slightly out-slanting mouth, short neck, round shoulder gradually contracted downward, ring foot. 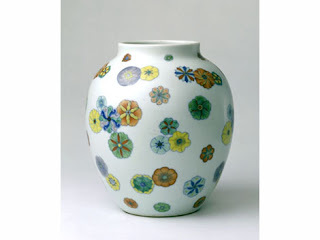 The jar is decorated all over the body with irregular medallions, which are commonly called ball flowers. The jar is glazed on both inner and outer sides. No mark at the bottom. The Qing Dynasty witnessed further development and progress of doucai firing since its birth in the Ming Dynasty. During the Yongzheng Period, enamel and gold glaze were introduced, and new technics like adding gold glaze to doucai and enamal to doucai were formed. Apart from the original colors of red, yellow, green, purple and reddish brown, a couple of new colors such as pink, carmine, pale pinkish purple, rose color, lake green, etc were added to doucai firing, which made it even more magnificent and beautiful. The mouth is in the shape of a garlic, narrow neck, sloping shoulder, round belly, ring foot, ruyi-shaped ears arranged in symmetric pattern between the mouth and the shoulder. The whole vase is decorated in doucai. The rim of the mouth is edged with fret patterns, and the garlic mouth is decorated with plucked branch and flower patterns. The neck is ridged with three layers of decorations, curly grass, flowers, and Japanese banana leaves respectively. There are ruyi cloud pattern and distorted lotus petal pattern respectively on the vase shoulder and shank. The belly is decorated with six groups of plucked branch and flower pattern, alternated with interlocking lotus. On the out bottom six characters in regular script written in two lines within the double blue-and-white rings, which read, "Daqing Yongzheng Nianzhi" (literally, made in Yongzheng Period of the Great Qing Dynasty). Convex body, round rim, small mouth, short and straight neck, plump shoulder, round and bulgy upper belly, arc-shaped lower belly, foot slanting outward, the bottom sunken to form ring foot. The whole vase are decorated with doucai flower patterns, the neck four groups of flowers, the shoulder interlocking lotus flowers, the belly themed with six groups of plucked flowers patterns with the upper and lower part alternated with distorted entwining lotuses, and the shank interlocking composite flowers. On the bottom of the vase six characters in regular script written in two lines within the double blue-and-white rings, which read, "Daqing Yongzheng Nianzhi" (literally, made in Yongzheng Period during the Great Qing Dynasty). i have a pair of Doucai Gaoshi tea cups which are almost identical to yours shown in the pictures. They were left behind by my late dad who kept lots of old paintings and porcelains. Just wondering where you can get expert opinions about the authenticity of these old items. Thank you for visiting the site. I think if you are able to take it to a museum specialist to get it analyzed. If you want to take some pics and send it to me I may be able to assist you. Thank you again. 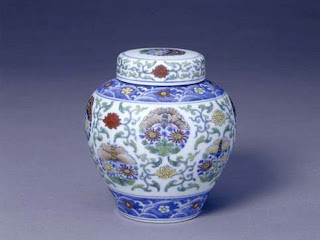 I'm studying a jar with very similar colors and decoration style. May I sent you some pictures as well ?